← The Power of Resurrection? Although not a bad hymn, it does reflect an image of a victorious superhero Jesus and doesn’t really do justice to the story, or to the importance of suffering as the means to triumph. Another more recent song, In Christ Alone, reflects the transactional view. I really like this song too – and am moved when it is sung. However the understanding of the events of the life, death, and resurrection of Jesus leaves something to be desired. This song portrays a transaction satisfying the wrath of God. It seems to me that the death and resurrection is reduced to “playacting” rather than a profound and earth-shaking and earth-shaping event. Christ the Lord is Risen Today! This Sunday our service started with another hymn, one which I believe better captures the victory of the Resurrection. This one by Charles Wesley. All creation join to say, Alleluia! Where’s thy victory, O grave? Alleluia! Still not perfect, perhaps a little too transactional (but we can’t expect sophisticated nuance in a hymn). This is a victory, not a forces of good-versus forces of evil victory or a straightforward transaction, but love’s redeeming work opening up the way to God’s ordained and intended future. The last two lines can be read in two different ways. First – we claim our exalted head through the cross and grave and are remade as the people of God. But they can also be read as a reference, perhaps, to Luke 9: “If anyone wishes to come after Me, he must deny himself, and take up his cross daily and follow Me.” As we soar where Christ has led we live in hope of the future, but face the need to follow through the trials and tribulations of this life, including persecution and the effects of evil in human society. 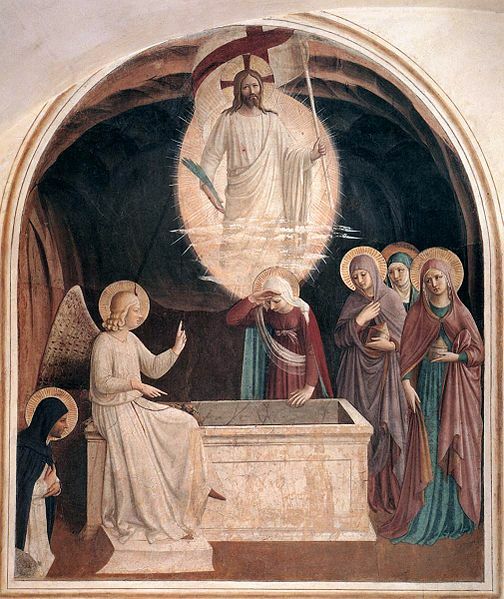 Easter and Resurrection are not about ‘Super Hero Jesus’, nor about ‘Transaction Jesus’. Rather we have, it seems to me, ‘Inauguration Jesus’ and the coming Kingdom of God. We would do well to think about what this means as we study the life and teachings of Jesus. What hymn or song do you think best portrays the meaning of the Resurrection? Why? You may also comment on He is Risen Indeed! at Jesus Creed.